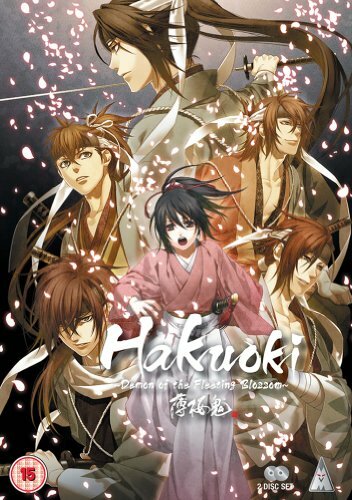 This month saw the UK release of “Hakuoki Series One Collection” on DVD. It's a two-disc set, containing twelve episodes, six on each disc. First of all, let's get one thing straight; I'm not the target audience for this anime. It's based on an otome video game (a romance video game aimed at girls). Me being a thirty-something guy, I haven't played the game, and therefore, I may have a different view to that of our female readers out there, but anyway, here's my review! Chizuru is also pursued by some other characters, calling themselves Devils, who also seem to be unbeatable in a fight, and appear to possess some extraordinary powers. How do they know about Chizuru? And what is their interest in her? The Shinsengumi in this anime are loosely based on the actual real-life members of the Shinsengumi, all having the same names as those featured in this series. The story here also takes place around actual events in Japan's history, such as famous battles, and politics. The series seemed to dwell a little too much on this for my liking, making it feel a little muddled, and not driving the storyline forward quickly enough. Perhaps if you have an interest in Japan's history, then this series could be for you. Of course it doesn't just involve historical events, there's also the matter of who these strange red-eyed men are, and how does Chizuru fit into all this? 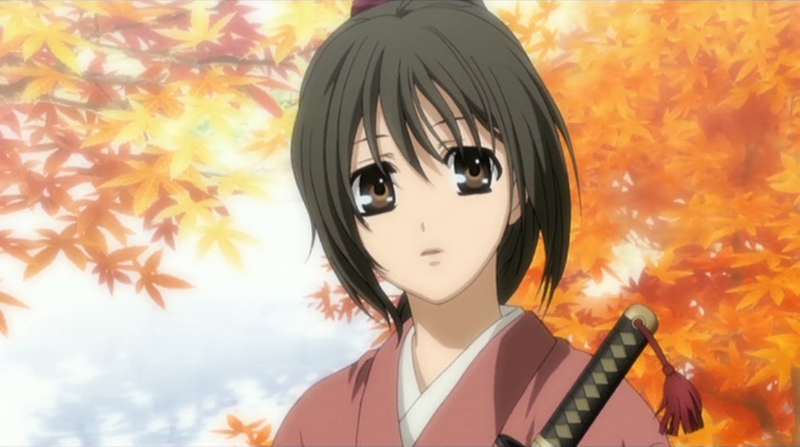 Chizuru, as the protagonist of this series, seemed a little pathetic in my opinion, in that she always seemed to be the damsel in distress, waiting for someone to save her. While this might be okay in some circumstances, you'd think that in the four years she spent with the Shinsengumi, she'd at least learn some self defence or combat skills. She does carry around with her a short-sword after all. Having said that, this is aimed at the female demographic, which might be why the series likes to look at the relationships, interplay, and possible romance between Chizuru and various members of the Shinsengumi, rather than focus on all out action. Not that girls don't like action too! 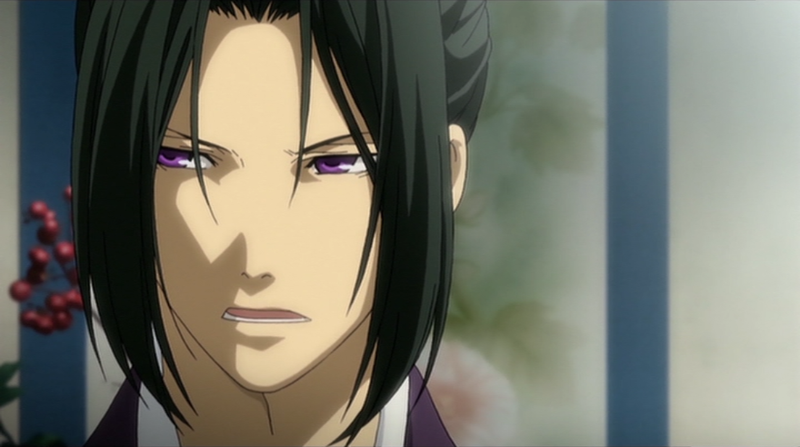 At the beginning of episode one, Chizuru's narration hints at romantic feelings toward Toshizo Hijikata, second in command of the Shinsengumi. These feelings, however, aren't really developed much, and we soon move on to her interaction with some of the other characters. 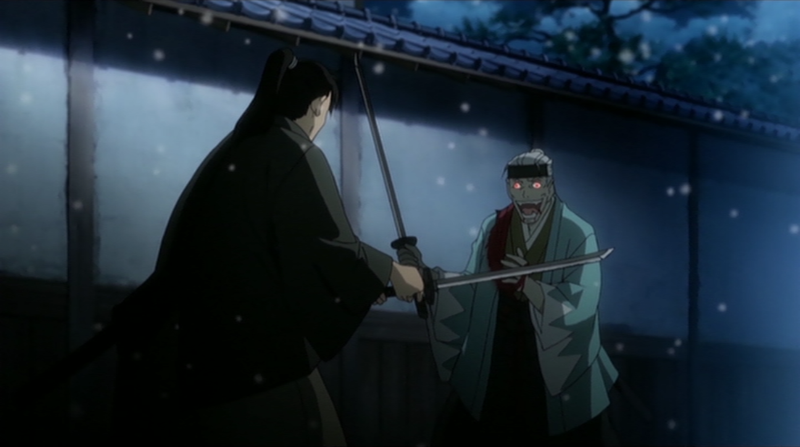 Each episode does however have it's fair share of action, with fights between the Shinsengumi and the Devils, and with rival domains, among others. Some of these can be pretty bloody at times, though they didn't seem to be overly graphic. There's also the supernatural part to the story; the demonic looking men, Failed Warriors as they're better known. Chizuru's relationship with the Shinsengumi begins the series rather uneasily, but as the series progresses they warm to each other, with the Shinsengumi becoming rather protective of her. Even though there is a lot of interaction between the characters of Hakuoki, their relationships aren't really developed very far, and we don't see much beyond the Shinsengumi becoming more loyal to Chizuru as the story progresses, and vice versa. It's quite a large ensemble cast of characters featured in Hakuoki, and perhaps because I was concentrating on the subtitles for much of the time, it took me quite a while to remember everyone’s names, or to recognise which ones were which. Perhaps the English dub could help alleviate this. The Japanese voice acting was pretty good, however there were a few spelling / grammatical errors in the subtitles, for example at the beginning of episode five, we are told the date is August 1964, when in fact it should read 1864. Of course this doesn't matter too much, as it's obvious it's set in the nineteenth century, but you'd expect this kind of thing to have been spotted before release. I tried the English dub for episode one, after watching first with the Japanese soundtrack, but I couldn't stick with it. Chizuru's voice, I felt, didn't suit her well compared to the Japanese soundtrack, and the dialogue for the Shinsengumi didn't always feel too natural. Otherwise, the dub seemed okay; not great, but okay enough to get by if you don't like subtitles. Also, it's just not as good as the original Japanese soundtrack acting-wise (as is usual, in my opinion). The artwork was well drawn, with some great looking backdrops, and some decent animation. The character designs are pretty cool too, each having their own distinctive look. Fan service enthusiasts will be disappointed, as there's none present, though this is probably a good thing, as it would seem out of place to be included here. This two-disc set is a little thin on the ground when it comes to extras. There's a clean opening animation, a clean closing animation, and some trailers for some other anime titles. Not a lot then. Overall, it's quite a slow-moving series; not boring, just quite slow. It's a good thing that there is at least some action to break things up; it's a good contrast to the political intrigue and relationship elements. It's not really until the second half of the series that things start to get more interesting, when storyline expands on the Devils' storyline. A more in depth look at the relationships between the characters would have made the series a lot more interesting, but maybe that's something for series two and onwards... I hope so! I know I sound quite negative about it, but I did actually enjoy it. With a slightly nippier pace, and a stronger heroine, I could have enjoyed this a lot more.